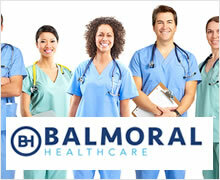 Thank you for your interest in Balmoral Healthcare. To register with us, please complete our application pack and telephone us to arrange an interview. The offer to become a member of the Agency is subject to satisfactory references, pre-employment consultancy screening clearance and meeting the membership criteria of the Agency. When all checks have been completed and you have been cleared to work you will need to collect your Identity Badge. You will also need a uniform before you start to work (Balmoral have these available to purchase for £20). Thank you for choosing Balmoral Healthcare. Should you have any queries regarding the above, please do not hesitate to contact me directly on 028 9038 0808. Please note you have 3 months to complete your application from the date of your interview.